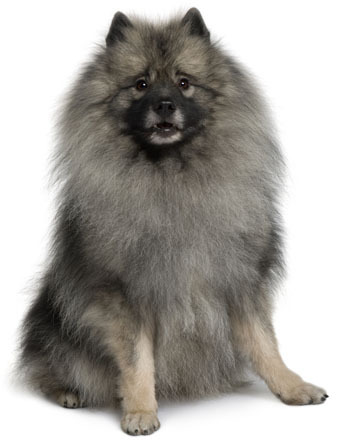 Learn about the temperament and personality of the Keeshond. Discover what he's like to live with, his traits and characteristics and how he generally behaves. And look at lots of Keeshond photos. The Keeshond is an incredibly affectionate and devoted people-dog. One of the few breeds who has never been bred to hunt or attack, they have been bred for centuries solely for companionship. These are good-natured dogs who love everyone. Even so, they do make wonderful watchdogs as they are quick to sound the alarm if someone they don't know approaches their home. Keeshonden are renowned for their special fondness for children. They love to play with them and are incredibly patient with little ones. This is a dog who will be devoted to the whole family -- he is not a "one-man dog." The Keeshond is highly intelligent and has a tendency to want to do things his own way. For this reason, obedience training is important. These dogs are ideal for formal obedience competition because they are very smart, eager to learn, eager to please, quick to obey, and they love to show off. They also tend to love agility, rally, and flyball. The Keeshond is an energetic dog and requires daily exercise. In fact, he will take all the exercise you can give him. He loves to go for long walks, and he also loves to go for rides in the car. Keeshonden crave your affection and attention and want to go wherever you go and do whatever you do. They love life and they make it their job to love you. They are extremely sensitive to their people's moods and love to cuddle when you need it. For this reason, among others, they are popular therapy dogs. Keeshonden remain playful and bouncy well into old age, and some of them even smile. If they do get lonely, they can become destructive. They can also be chatty, but they are usually barking for a reason. The Keeshond can live anywhere, apartment or farm, as long as they are with their people. They are quick to housetrain and quick to bond with their families. The Keeshond is very intelligent and easy to train. He learns new commands very fast. The Keeshond is a very heavy shedder. He sheds an awful lot of hair! You'll find hair all over your home, stuck to everything! You'll probably even find it in the butter!